This article is about the event. For other uses, see Circus (disambiguation). "3 ring circus" redirects here. For the Martin and Lewis film, see 3 Ring Circus. A circus is a company of performers that may include clowns, acrobats, trained animals, trapeze acts, musicians, hoopers, tightrope walkers, jugglers, unicyclists, as well as other object manipulation and stunt-oriented artists. The term 'circus' also describes the performance which has followed various formats through its 250-year modern history. Philip Astley is credited with being the 'father' of the modern circus when he opened the first circus in 1768 in England. Early circuses were almost exclusively demonstrations of equestrian skills with a few other types of acts to link the horsemanship performances. Performances developed significantly through the next fifty years, with large scale theatrical battle reenactments becoming a significant feature. The 'traditional' format, whereby a ringmaster introduces a varied selection of acts that mostly perform choreographed acts to traditional music, developed in the latter part of 19th century and continued almost universally to be the main style of circus up until the 1970s. 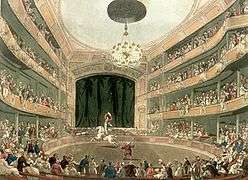 As styles of performance have changed since the time of Astley, so too have the types of venues where these circuses have performed. The earliest modern circuses were performed in open air structures with limited covered seating. From the late 18th to late 19th century custom-made circus buildings (often wooden) were built with various types of seating, a centre ring, and sometimes a stage. The 'traditional' large tents, commonly known as 'Big Tops' were introduced in the mid 19th century as touring circuses superseded static venues. These tents eventually became the most common venue and remain so to the present day. Contemporary circuses perform in a variety of venues including tents, theatres and casinos. Many circus performances are still held in a ring usually 13 m (42 ft) in diameter. This dimension was adopted by Philip Astley in the late 18th century as the minimum diameter that enabled an acrobatic horse rider to stand upright on a cantering horse to perform their tricks. First attested in English 14th century, the word circus derives from Latin circus, which is the romanization of the Greek κίρκος (kirkos), itself a metathesis of the Homeric Greek κρίκος (krikos), meaning "circle" or "ring". In the book De Spectaculis early Christian writer Tertullian claimed that the first circus games were staged by the goddess Circe in honor of her father Helios, the Sun God. Video of a circus from 1954. The modern and commonly held idea of a 'circus' is of a Big Top with various acts providing entertainment therein. However, the history of circuses is more complex, with historians disagreeing on its origin, as well as revisions being done about the history due to the changing nature of historical research, and the ongoing 'circus' phenomenon. For many, circus history begins with Englishman Philip Astley, while for others its origins go back much further—to Roman times. The first circus in the city of Rome was the Circus Maximus, in the valley between the Palatine and Aventine hills. It was constructed during the monarchy and, at first, built completely from wood. After being rebuilt several times, the final version of the Circus Maximus could seat 250,000 people; it was built of stone and measured 400m in length and 90m in width. Next in importance were the Circus Flaminius and the Circus Neronis, from the notoriety which it obtained through the Circensian pleasures of Nero. A fourth circus was constructed by Maxentius; its ruins have helped archaeologists reconstruct the Roman circus. For some time after the fall of Rome, large circus buildings fell out of use as centres of mass entertainment. Instead, itinerant performers, animal trainers and showmen travelled between towns throughout Europe, performing at local fairs. The origin of the modern circus has been attributed to Philip Astley, a cavalry officer from England who set up the first modern amphitheatre for the display of horse riding tricks in Lambeth, London on 4 April 1768. Astley did not originate trick horse riding, nor was he first to introduce acts such as acrobats and clowns to the English public, but he was the first to create a space where all these acts were brought together to perform a show. Astley performed stunts in a 42 ft diameter ring, which is the standard size used by circuses ever since. Astley referred to the performance arena as a Circle and the building as an amphitheatre but these were to later be known as a Circus. Astley was followed by Andrew Ducrow, whose feats of horsemanship had much to do with establishing the traditions of the circus, which were perpetuated by Henglers and Sangers celebrated shows in a later generation. In England circuses were often held in purpose built buildings in large cities, such as the London Hippodrome, which was built as a combination of the circus, the menagerie and the variety theatre, where wild animals such as lions and elephants from time to time appeared in the ring, and where convulsions of nature such as floods, earthquakes and volcanic eruptions have been produced with an extraordinary wealth of realistic display. Joseph Grimaldi, the first mainstream clown, had his first major role as Little Clown in the pantomime The Triumph of Mirth; or, Harlequin's Wedding in 1781. The Royal Circus opened in London on 4 November 1782 by Charles Dibdin and his partner Charles Hughes. In 1782, Astley established the Amphithéâtre Anglais in Paris, the first purpose-built circus in France, followed by 18 other permanent circuses in cities throughout Europe. Astley leased his Parisian circus to the Italian Antonio Franconi in 1793. In 1826, the first circus took place under a canvas big top. The Scotsman John Bill Ricketts brought the first modern circus to the United States. He began his theatrical career with Hughes Royal Circus in London in the 1780s, and travelled from England in 1792 to establish his first circus in Philadelphia. The first circus building in the US opened on April 3, 1793 in Philadelphia, where Ricketts gave America's first complete circus performance. George Washington attended a performance there later that season. In the Americas during the first two decades of the 19th century, the Circus of Pepin and Breschard toured from Montreal to Havana, building circus theatres in many of the cities it visited. Victor Pépin, a native New Yorker, was the first American to operate a major circus in the United States. Later the establishments of Purdy, Welch & Co., and of van Amburgh gave a wider popularity to the circus in the United States. 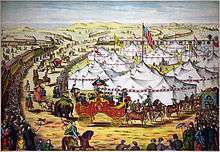 In 1825, Joshuah Purdy Brown was the first circus owner to use a large canvas tent for the circus performance. Circus pioneer Dan Rice was the most famous pre-Civil War circus clown, popularizing such expressions as "The One-Horse Show" and "Hey, Rube!". The American circus was revolutionized by P. T. Barnum and William Cameron Coup, who launched the travelling P. T. Barnum's Museum, Menagerie & Circus, the first freak show. Coup also introduced the first multiple ringed circuses, and was also the first circus entrepreneur to use circus trains to transport the circus between towns, a practice that continues today. In 1838, the equestrian Thomas Taplin Cooke returned to England from the United States, bringing with him a circus tent. At this time, itinerant circuses were becoming popular in Britain. William Batty's circus, for example, between 1838 and 1840, travelled from Newcastle to Edinburgh and then to Portsmouth and Southampton. Pablo Fanque, who is noteworthy as Britain's only black circus proprietor and who operated one of the most celebrated travelling circuses in Victorian England, erected temporary structures for his limited engagements or retrofitted existing structures. One such structure in Leeds, which Fanque assumed from a departing circus, collapsed, resulting in minor injuries to many but the death of Fanque's wife. Three important circus innovators were Italian Giuseppe Chiarini, and Frenchmen Louis Soullier and Jacques Tourniaire, whose early travelling circuses introduced the circus to Latin America, Australia, South East Asia, China, South Africa and Russia. Soullier was the first circus owner to introduce Chinese acrobatics to the European circus when he returned from his travels in 1866 and Tourniaire was the first to introduce the performing art to Ranga where it became extremely popular. Following Barnum's death, his circus merged with that of James Anthony Bailey, and travelled to Europe as the Barnum & Bailey Greatest Show On Earth, where it toured from 1897 to 1902, impressing other circus owners with its large scale, its touring techniques (including the tent and circus train), and its combination of circus acts, a zoological exhibition and a freak show. 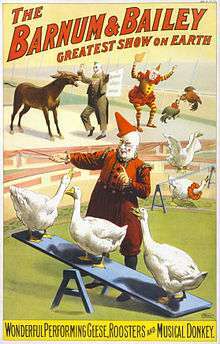 This format was adopted by European circuses at the turn of the 20th century. The influence of the American circus brought about a considerable change in the character of the modern circus. In arenas too large for speech to be easily audible, the traditional comic dialog of the clown assumed a less prominent place than formerly, while the vastly increased wealth of stage properties relegated to the background the old-fashioned equestrian feats, which were replaced by more ambitious acrobatic performances, and by exhibitions of skill, strength and daring, requiring the employment of immense numbers of performers and often of complicated and expensive machinery. In 1919, Lenin, head of the USSR, expressed a wish for the circus to become 'the people's art-form', with facilities and status on par with theatre, opera and ballet. The USSR nationalized Russian circuses. In 1927, the State University of Circus and Variety Arts, better known as the Moscow Circus School, was established; performers were trained using methods developed from the Soviet gymnastics program. When the Moscow State Circus company began international tours in the 1950s, its levels of originality and artistic skill were widely applauded. The International Circus Festival of Monte-Carlo has been held in Monte Carlo since 1974 and was the first of many international awards for circus performers. From the late 19th century through the first half of the 20th century, travelling circuses were a major form of spectator entertainment in the US and attracted huge attention whenever they arrived in a city. After World War II, the popularity of the circus declined as new forms of entertainment (such as television) arrived and the public's tastes became more sophisticated. 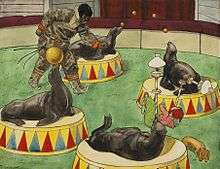 From the 1960s onward, circuses attracted growing criticism from animal rights activists. Many circuses went out of business or were forced to merge with other circus companies. Nonetheless, a good number of travelling circuses are still active in various parts of the world, ranging from small family enterprises to three-ring extravaganzas. Other companies found new ways to draw in the public with innovative new approaches to the circus form itself. Contemporary circus (originally known as nouveau cirque) is a recent performing arts movement that originated in the 1970s in Australia, Canada, France, the West Coast of the United States, and the United Kingdom. Contemporary circus combines traditional circus skills and theatrical techniques to convey a story or theme. Compared with the traditional circus, the contemporary genre of circus tends to focus more attention on the overall aesthetic impact, on character and story development, and on the use of lighting design, original music, and costume design to convey thematic or narrative content. For aesthetic or economic reasons, contemporary circus productions may sometimes be staged in theatres rather than in large outdoor tents. Music used in the production is often composed exclusively for that production, and aesthetic influences are drawn as much from contemporary culture as from circus history. Animal acts appear less frequently in contemporary circus than in traditional circus. Early examples of nouveau cirque companies include: Circus Oz, forged in Australia in 1978 from SoapBox Circus and New Circus, both founded in the early 1970s; the Pickle Family Circus, founded in San Francisco in 1975; Ra-Ra Zoo in the UK in 1983, Nofit State Circus in 1984 from Wales; Cirque du Soleil, founded in Quebec in 1984; and Archaos in 1986. More recent examples include: Teatro ZinZanni, founded in Seattle in 1998; Quebec's Cirque Éloize; Les 7 doigts de la main (also known as The 7 Fingers); and the West African Circus Baobab in the late 1990s. The genre includes other circus troupes such as the Vermont-based Circus Smirkus (founded in 1987 by Rob Mermin), Le Cirque Imaginaire (later renamed Le Cirque Invisible, both founded and directed by Victoria Chaplin, daughter of Charlie Chaplin), the Tiger Lillies, Dislocate, and Vulcana Women's Circus, while The Jim Rose Circus is an interesting take on the sideshow. Swedish contemporary circus company Cirkus Cirkör was founded in 1995. U.S. Company PURE Cirkus was founded in the subgenre of "cirque noir" in 2004, and in Northern England, (United Kingdom), Skewed Circus combines punk, rap, dance music, comedy, and stunts to deliver "pop-circus" entertainment to young urban audiences. 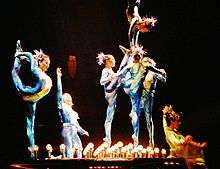 The most conspicuous success story in the contemporary genre has been that of Cirque du Soleil, the Canadian circus company whose estimated annual revenue now exceeds US$810 million, and whose nouveau cirque shows have been seen by nearly 90 million spectators in over 200 cities on five continents. Despite the contemporary circus' shift toward more theatrical techniques and its emphasis on human rather than animal performance, traditional circus companies still exist alongside the new movement. Numerous circuses continue to maintain animal performers, including Ringling Brothers and Barnum and Bailey Circus, UniverSoul Circus, and the Big Apple Circus from the United States, Circus Krone from Munich, Circus Royale and Lennon Bros Circus from Australia, Vazquez Hermanos Circus, Circo Atayde Hermanos, and Hermanos Mayaror Circus from Mexico, and Moira Orfei Circus from Italy, to name just a few. Fire breathers risk burns, both internal and external, as well as poisoning in the pursuit of their art. A traditional circus performance is often led by a ringmaster who has a role similar to a Master of Ceremonies. The ringmaster presents performers, speaks to the audience, and generally keeps the show moving. The activity of the circus traditionally takes place within a ring; large circuses may have multiple rings, like the six-ringed Moscow State Circus. A circus often travels with its own band, whose instrumentation in the United States has traditionally included brass instruments, drums, glockenspiel, and sometimes the distinctive sound of the calliope. Common acts include a variety of acrobatics, gymnastics (including tumbling and trampoline), aerial acts (such as trapeze, aerial silk, corde lisse), contortion, stilts, and a variety of other routines. Juggling is one of the most common acts in a circus; the combination of juggling and gymnastics is called equilibristics and include acts like plate spinning and the rolling globe. Acts like these are some of the most common, and the most traditional. Clowns are common to most circuses and are typically skilled in many circus acts; "clowns getting into the act" is a very familiar theme in any circus. Famous circus clowns have included Austin Miles, the Fratellini Family, Rusty Russell, Emmett Kelly, Grock, and Bill Irwin. Daredevil stunt acts and sideshow acts are also parts of some circus acts, these activities may include human cannonball, chapeaugraphy, fire eating, breathing, and dancing, knife throwing, magic shows, sword swallowing, or strongman. Famous sideshow performers include Zip the Pinhead and The Doll Family. A popular sideshow attraction from the early 19th century was the flea circus, where fleas were attached to props and viewed through a Fresnel lens. 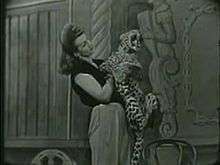 Female lion tamer and leopard. A variety of animals have historically been used in acts. While the types of animals used vary from circus to circus, big cats, elephants, horses, birds, sea lions, bears, and domestic animals such as cats and dogs are the most common. The earliest involvement of animals in circus was just the display of exotic creatures in a menagerie. Going as far back as the early eighteenth century, exotic animals were transported to North America for display, and menageries were a popular form of entertainment. 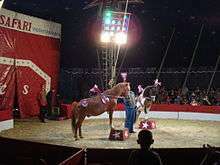 The first true animals acts in the circus were equestrian acts. Soon elephants and big cats were displayed as well. Isaac A. 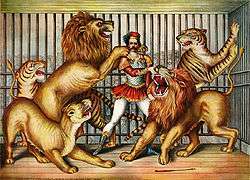 Van Amburgh entered a cage with several big cats in 1833, and is generally considered to be the first wild animal trainer in American circus history. Mabel Stark was a famous female tiger-tamer. Elephant act at a 2009 circus in Pachuca, Hidalgo, Mexico. In December 2014, as a response to reports of animal mistreatment, the Mexican Congress passed a law banning the use of animals in any circus in the country. The law set fines for violations and required circuses to submit lists of the wildlife they possessed, which would then be made available to zoos interested in taking the animals. Animal welfare groups have documented many cases of animal cruelty in the training of performing circus animals. The animal rights group People for the Ethical Treatment of Animals (PETA) contends that animals in circuses are frequently beaten into submission and that physical abuse has always been the method for training circus animals. According to PETA, although the US Animal Welfare Act does not permit the use of electric shock prods, whips, hooks, or similar instruments by trainers, these are still used today. According to PETA, during an undercover investigation of Carson & Barnes Circus, video footage was captured showing animal care director Tim Frisco training endangered Asian elephants with electrical shock prods and instructing other trainers to "beat the elephants with a bullhook as hard as they could and to sink the sharp metal bullhook into the animals' flesh and twist it until they screamed in pain." animals are trained through discipline. Based on these findings, the researchers called for more stringent regulation regarding the welfare of circus animals. In 2012, the Dutch government announced a ban on the use of wild circus animals. In testimony in U.S. District Court in 2009, Ringling Bros. and Barnum & Bailey Circus CEO Kenneth Feld acknowledged that circus elephants are struck behind the ears, under the chin and on their legs with metal tipped prods, called bull hooks. Feld stated that these practices are necessary to protect circus workers. Feld also acknowledged that an elephant trainer was reprimanded for using an electric shock device, known as a hot shot or electric prod, on an elephant, which Feld also stated was appropriate practice. Feld denied that any of these practices harm elephants. In its January 2010 verdict on the case, brought against Feld Entertainment International by the American Society for the Prevention of Cruelty to Animals 'et al. ', the Court ruled that evidence against the circus company was "not credible with regard to the allegations". In lieu of a USDA hearing, Feld Entertainment Inc. (parent of Ringling Bros.) agreed to pay an unprecedented $270,000 fine for violations of the Animal Welfare Act that allegedly occurred between June 2007 and August 2011. On February 1, 1992 at the Great American Circus in Palm Bay, Florida, an elephant named Janet (1965 – February 1, 1992) went out of control while giving a ride to a mother, her two children, and three other children. 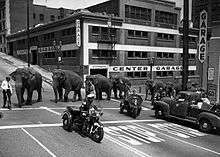 The elephant then stampeded through the circus grounds outside before being shot to death by police. Also, during a Circus International performance in Honolulu, Hawaii on 20 August 1994, an elephant called Tyke (1974 – August 20, 1994) killed her trainer, Allen Campbell, and severely mauled her groomer, Dallas Beckwith, in front of hundreds of horrified spectators. Tyke then bolted from the arena and ran through the streets of Kakaako for more than thirty minutes. Police fired 86 shots at Tyke, who eventually collapsed from the wounds and died. In 1998 in the UK, a parliamentary working group chaired by MP Roger Gale studied living conditions and treatment of animals in UK circuses. All members of this group agreed that a change in the law was needed to protect circus animals. Mr. Gale told the BBC, "It's undignified and the conditions under which they are kept are woefully inadequate—the cages are too small, the environments they live in are not suitable and many of us believe the time has come for that practice to end." The group reported concerns about boredom and stress, and noted that an independent study by a member of the Wildlife Conservation Research Unit at Oxford University "found no evidence that circuses contribute to education or conservation." However, in 2007, a different working group under the UK Department for Environment, Food and Rural Affairs, having reviewed information from experts representing both the circus industry and animal welfare, found an absence of "scientific evidence sufficient to demonstrate that travelling circuses are not compatible with meeting the welfare needs of any type of non-domesticated animal presently being used in the United Kingdom." According to that group's report, published in October 2007, "there appears to be little evidence to demonstrate that the welfare of animals kept in travelling circuses is any better or any worse than that of animals kept in other captive environments." A ban prohibiting the use of wild animals in circuses in Britain was due to be passed in 2015, but Conservative MP Christopher Chope repeatedly blocked the bill under the reasoning that "The EU Membership Costs and Benefits bill should have been called by the clerk before the circuses bill, so I raised a point of order". He explained that the circus bill was "at the bottom of the list" for discussion. The Animal Defenders International non-profit group dubbed this "a huge embarrassment for Britain that 30 other nations have taken action before us on this simple and popular measure". There are nationwide bans on using some if not all animals in circuses in Sweden, Costa Rica, India, Finland, Singapore, Switzerland, Norway, Austria, Belgium, Bosnia and Herzegovina, Croatia, Czech Republic, Cyprus, Estonia, Greece, Hungary, Poland, Portugal, Slovenia, Bolivia, Colombia, Ecuador, El Salvador, Panama, Paraguay, Peru, Israel, Taiwan, Malta, Netherlands, and Denmark. Spain, Ireland, United Kingdom, Argentina, Austria, Chile, Brazil, Canada, Mexico, and the United States have locally restricted or banned the use of animals in entertainment. In response to a growing popular concern about the use of animals in entertainment, animal-free circuses are becoming more common around the world. In 2009, Bolivia passed legislation banning the use of any animals, wild or domestic, in circuses. The law states that circuses "constitute an act of cruelty." Circus operators had one year from the bill's passage on July 1, 2009 to comply. Greece became the first European country to ban any animal from performing in any circus in its territory in February 2012, following a campaign by Animal Defenders International and the Greek Animal Welfare Fund (GAWF). On June 6, 2015, the Federation of Veterinarians of Europe adopted a position paper in which it recommends the prohibition of the use of wild animals in traveling circuses. In other countries, purpose-built circus buildings still exist which are no longer used as circuses, or are used for circus only occasionally among a wider programme of events; for example, the Cirkusbygningen (The Circus Building) in Copenhagen, Denmark, Cirkus in Stockholm, Sweden, or Carré Theatre in Amsterdam, Netherlands. 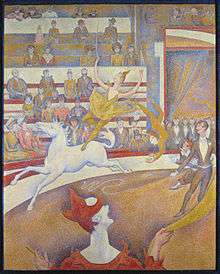 The Circus, by Georges Seurat, painted 1891. Original in Musée d'Orsay, Paris. The atmosphere of the circus has served as a dramatic setting for many musicians. The most famous circus theme song is called "Entrance of the Gladiators", and was composed in 1904 by Julius Fučík. Other circus music includes "El Caballero", "Quality Plus", "Sunnyland Waltzes", "The Storming of El Caney", "Pahjamah", "Bull Trombone", "Big Time Boogie", "Royal Bridesmaid March", "The Baby Elephant Walk", "Liberty Bell March", "Java", Strauss's "Radetsky March", and "Pageant of Progress". A poster for Pablo Fanque's Circus Royal, one of the most popular circuses of Victorian England, inspired John Lennon to write Being for the Benefit of Mr. Kite! on The Beatles' album, Sgt. Pepper's Lonely Hearts Club Band. The song title refers to William Kite, a well-known circus performer in the 19th century. Producer George Martin and EMI engineers created the song's fairground atmosphere by assembling a sound collage of collected recordings of calliopes and fairground organs, which they cut into strips of various lengths, threw into a box, and then mixed up and edited together randomly, creating a long loop which was mixed into the final production. Another traditional circus song is the John Philip Sousa march "Stars and Stripes Forever", which is played only to alert circus performers of an emergency. Plays set in a circus include the 1896 musical The Circus Girl by Lionel Monckton, Polly of the Circus written in 1907 by Margaret Mayo, He Who Gets Slapped written by Russian Leonid Andreyev 1916 and later adapted into one of the first circus films, Caravan written in 1932 by Carl Zuckmayer, the revue Big Top written by Herbert Farjeon in 1942, Top of the Ladder written by Tyrone Gutheris in 1950, Stop the World, I Want to Get Off written by Anthony Newley in 1961, and Barnum with music by Cy Coleman and lyrics and book by Mark Bramble, Roustabout: The Great Circus Train Wreck written by Jay Torrence in 2006. Following World War I, circus films became popular. In 1924 He Who Gets Slapped was the first film released by MGM; in 1925 Sally of the Sawdust (remade 1930), Variety, and Vaudeville were produced, followed by The Devil's Circus in 1926 and The Circus starring Charlie Chaplin, Circus Rookies, 4 Devils; and Laugh Clown Laugh in 1928. German film Salto Mortale about trapeze artists was released in 1930 and remade in the United States and released as Trapeze starring Burt Lancaster in 1956; in 1932 Freaks was released; Charlie Chan at the Circus, Circus (USSR) and The Three Maxiums were released in 1936 and At the Circus starring the Marx Brothers and You Can't Cheat an Honest Man in 1939. Circus films continued to be popular during the Second World War; films from this era included The Great Profile starring John Barrymore (1940), the animated Disney film Dumbo (1941), Road Show (1941), The Wagons Roll at Night (1941) and Captive Wild Woman (1943). Tromba, a film about a tiger trainer, was released in 1948. In 1952 Cecil B. de Mille's Oscar-winning film The Greatest Show on Earth was first shown. Released in 1953 were Man on a Tightrope and Ingmar Bergman's Gycklarnas afton (released as Sawdust and Tinsel in the United States); these were followed by Life Is a Circus; Ring of Fear; 3 Ring Circus (1954) and La Strada (1954), an Oscar-winning film by Federico Fellini about a girl who is sold to a circus strongman. Fellini made a second film set in the circus called The Clowns in 1970. Films about the circus made since 1959 include the B-movie Circus of Horrors (1960); the musical film Billy Rose's Jumbo (1962); A Tiger Walks, a Disney film about a tiger that escapes from the circus; and Circus World (1964), starring John Wayne. In the film Jungle Emperor Leo (1997), Leo's son Lune is captured and placed in a circus, which burns down when a tiger knocks down a ring of fire while jumping through it. The TV series Circus Humberto, based on the novel by Eduard Bass, follows the history of the circus family Humberto between 1826 and 1924. The setting of the HBO television series Carnivàle, which ran from 2003 to 2005, is also largely set in a travelling circus. The circus has also inspired many writers. Numerous books, both non-fiction and fiction, have been published about circus life. Notable examples of circus-based fiction include Circus Humberto by Eduard Bass, Cirque du Freak by Darren Shan, and Spangle by Gary Jennings. The novel Water for Elephants by Sara Gruen tells the fictional tale of a circus veterinarian and was made into a movie with the same title, starring Robert Pattinson and Reese Witherspoon. Circus is the central theme in comic books of Super Commando Dhruva, an Indian comic book superhero. According to this series, Dhruva was born and brought up in a fictional Indian circus called Jupiter Circus. When a rival circus burnt down Jupiter Circus, killing everyone in it, including Dhruva's parents, Dhruva vowed to become a crime fighter. A circus-based television series called Circus was also telecast in India in 1989 on DD National, starring Shahrukh Khan as the lead actor. ↑ Speaight, George (1980). A History of the Circus. London: The Tantivy Press. p. 11. ISBN 0498024709. ↑ Croft-Cooke & Cotes, Rupert & Peter (1976). Circus: A World History. London: Paul Elek. p. 27. ISBN 0236400517. ↑ "History of the Ludi". Novaroma.org. Retrieved 2012-04-20. ↑ Speaight, George (1980). A History of the Circus. London: Tantivy Press. ↑ The Oxford English Dictionary lists the 1791 book The History of the Royal Circus about Philip Astley's troupe as the first written use of the word to describe the modern circus. ↑ Stoddart, Helen (2000). Rings of Desire: Circus History and Representation. Manchester: Manchester University Press. pp. 13–15. ISBN 0719052343. ↑ McConnell Stott|, Andrew (2009), The Pantomime Life of Joseph Grimaldi, Canongate Books, p. 28. ↑ Mr Philip Astley's Introduction to The First Circus in England. PeoplePlay UK. Retrieved 18 March 2007. ↑ Philip Astley (British circus manager), Encyclopædia Britannica. ↑ Leathers, Victor L. (1959). British Entertainers in France, University of Toronto Press, 1959, p. 29. ↑ Banham, Martin (1995). The Cambridge Guide to Theatre, Cambridge University Press, 1995, p.216. ↑ "Historical Markers". Explore PA History. Retrieved 2012-04-20. ↑ "Person : Ricketts, John Bill". The Circus in America, 1793 – 1940. Retrieved 2012-04-20. ↑ "PHMC: Historical Markers Program: Ricketts' Circus". Archived from the original on 2007-12-19. ↑ "Circus in America TimeLine: 1801 – 1824". The Circus in America, 1793 – 1940. Retrieved 2012-04-20. 1 2 "Introduction". The Circus in America, 1793 – 1940. Retrieved 2012-04-20. ↑ William L. Slout (1998). Olympians of the Sawdust Circle: A Biographical Dictionary of the Nineteenth Century American Circus. Wildside Press LLC. pp. 60–. ISBN 978-0-8095-1310-9. Retrieved 9 June 2013. ↑ Griffin, J. "Frost, Thomas (1881), "Circus Life and Circus Celebrities." London: Chatto and Windus". Circushistory.org. Retrieved 2011-04-09. ↑ Leeds Intelligencer, 4 March 1854, p. 5, col. 3. ↑ Victoria and Albert Museum. "Victorian Circus". V&A. Retrieved 2011-06-19. ↑ "International Circus Festival of Monte-Carlo". Montecarlofestival.mc. 2012-04-15. Retrieved 2012-04-20. ↑ "The 7 Fingers". Les7doigtsdelamain.com. Retrieved 2012-04-20. ↑ "Circus Baobab". Circus Baobab. Retrieved 2012-04-20. ↑ "Dislocate". Dislocate. Retrieved 2012-04-20. ↑ "Vulcana Women's Circus". Vulcana.org.au. Retrieved 2012-04-20. ↑ "Company PURE Cirkus". Purecirkus.com. Retrieved 2012-04-20. ↑ Skewed Circus Archived December 14, 2009, at the Wayback Machine. ↑ Collins, Glenn (April 28, 2009). "Run Away to the Circus? No need. It's Staying Here". The New York Times. Retrieved 2009-09-30. ↑ "About Cirque du Soleil". Cirque du Soleil. Archived from the original on 2009-09-25. Retrieved 2009-09-30. ↑ Duckman, Hank (2006-01-01). "Hermanos Mayar Circus by Hank Duckman". Mexconnect.com. Retrieved 2012-04-20. ↑ "Moira Orfei Circo official website". Moiranonsolocirco.it. Retrieved 2012-04-20. ↑ "The history of circus in the US, ''HistoryMagazine''". History-magazine.com. Archived from the original on 2012-04-14. Retrieved 2012-04-20. 1 2 "Wild things: Mexico struggles to find new homes for outlawed circus animals". Fox News Latino. Retrieved 19 May 2015. ↑ "Circus Incidents: Attacks, Abuse and Property Damage" (PDF). Humane Society of the United States. 2004-06-01. Archived from the original (PDF) on 2008-05-28. Retrieved 2008-05-23. ↑ "Circuses". PETA.org. Retrieved 2012-04-20. ↑ "Animal Welfare Act and Animal Welfare Regulations". Nal.usda.gov. Retrieved 2012-04-20. 1 2 "Circuses: Three Rings of Abuse". Peta.org. Archived from the original on 2010-07-26. Retrieved 2012-04-20. ↑ "19 february 2008 – Projectvoorstel Ministerie LNV onderzoek welzijn circusdieren" (PDF). 19 February 2008. Retrieved 19 April 2013. ↑ "Dutch government announces ban on the use of wild animals in circuses". 1 November 2012. Retrieved 19 April 2013. ↑ Leigh Remizowski, "USDA Fines Ringling Bros. Circus Over Treatment of Animals," CNN 29 November 2011. ↑ St. Petersburg Times (May 6, 1993). "Elephant incidents in recent years". Retrieved 19 April 2010. ↑ "UK Politics Protect circus animals call". BBC News. 1998-10-26. Retrieved 2012-04-20. ↑ "Wild Animals in Travelling Circuses: The Report of the Chairman of the Circus Working Group". UK Department for Environment, Food and Rural Affairs. October 2007. Retrieved 24 February 2010. ↑ "Elephant Rampages" (PDF). Circuses.com. Retrieved 2012-04-20. ↑ "Bolivia bans use of animals in circuses". Associated Press. July 31, 2009. Retrieved 31 July 2009. ↑ "FVE position on the use of animals in travelling circuses" (PDF). Federation of Veterinarians of Europe. FVE/013/pos/007. Federation of Veterinarians of Europe. ↑ Winter, Stuart (2015-08-05). "Vets call for complete ban on wild animal acts in circuses across Europe". Express.co.uk. Retrieved 2015-08-08. ↑ "The Cirque Jules Verne Website". Cirquejulesverne.com. Retrieved 2013-11-18. ↑ Turner, Steve, "A Hard Day's Write." HarperCollins(1984). This article incorporates text from a publication now in the public domain: Chisholm, Hugh, ed. (1911). "Circus". Encyclopædia Britannica. 6 (11th ed.). Cambridge University Press. pp. 390–391. Dfening, Fred D., III (November 2007). "The American Circus in the 1870s: An Overview from Newspaper Sources". Bandwagon. Columbus, Ohio: Circus Historical Society. 51 (6): 4–60. ISSN 0005-4968. —provides an overview of "low-yield research" into the history of the American Circus as covered in "ragcontent newspapers [and] magazines [such as] White Tops"
Brooke, Bob (October–November 2001). "Step Right Up: Bob Brooke presents the history of the circus in America". History Magazine. 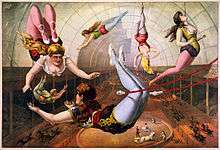 Wikimedia Commons has media related to Circus.